Stonehenge Prehistoric Monument World Heritage Site is run by English Heritage. 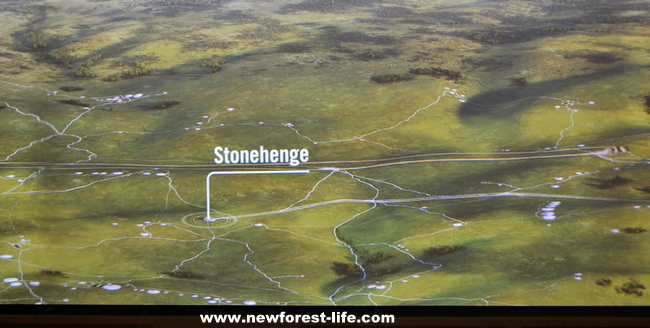 If you are visiting the New Forest, I would recommend this world class wonder of the world as a day out you'll thoroughly enjoy. I want to give you a good overview of what you will see, discover and experience. The new Visitor Centre, certainly gave me a greater understanding and feel for this wonderful prehistoric monument. I took all the photos I've used from the "virtual 360-degree experience which lets visitors ‘stand in the stones’". I hope they give you a feel of just how fantastic a visit to Stonehenge can be for you and what the new Visitor Centre has to offer. We visited recently with my Mum who was celebrating her 90th birthday. The weather was absolutely foul - very English with lashing, gale-ridden rain. Did it stop us enjoying our visit? Not in the least, mainly due to the warm, knowledgeable and passionate staff we met from the minute we walked into the entrance to Stonehenge. When should you visit and what should you see first? The Stones! Obvious but true; they are spectacular. There are two types of stone you'll see - the larger sarsen stones and the smaller 'bluestones'. How were they constructed with such limited tools? How did they get to where we see them today? Decide where you're going to go first. If you head for the stones first you can use the shuttle bus which is included in your entrance fee or decide to discover the landscape on the way and walk to the stones. The front shuttle is designed for any disabled visitors so just make your needs known to the friendly and welcoming staff. Once entering the exhibition room you can discover and really get the feel of the stones through the seasons. It was such a wet day all the photos on this review were taken in this area. It is totally stunning! Here's the description and what you can expect. This really works! "The virtual 360-degree experience which lets visitors ‘stand in the stones’ before they enter the gallery. This three-minute film, based on state-of-the-art laser scan images of the stone circle, transports the viewer back in time through the millennia and enables them to experience the summer and winter solstices. Credit Clare Kendall/English Heritage." Cafe serving hot drinks, salads, pastries, soup and hot snacks. An outdoor gallery including several reconstructed Neolithic houses will be constructed. Using archaeological evidence and authentic materials, these buildings will provide a glimpse of the lifestyles and technology of the Neolithic people. There was adverse publicity when the new Visitor Centre opened in late December 2013. The main criticism was crowds. The Visitor Centre was so popular it attracted more people than was envisaged, which made a visit less fulfilling. 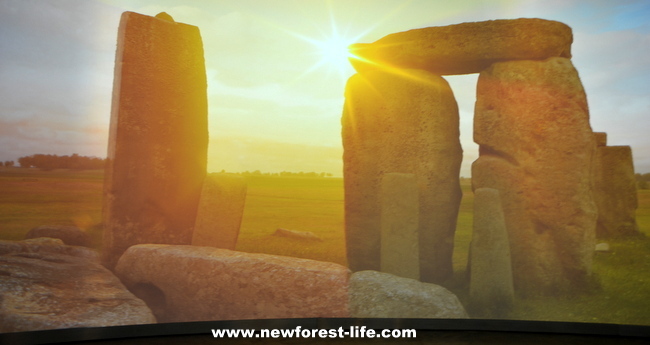 You need time to absorb both the atmosphere of Stonehenge and also the information which is so beautifully exhibited. I believe the problem has now been solved by the pre booked ticket service so suggest, like us on our visit, you make use of the service. I hope you enjoy your visit to Stonehenge Prehistoric Monument and World Heritage Site as much as we did on the day we decided to explore and discover this unique part of our English heritage.